You are currently browsing the archives for the “sitting” tag. C.S. Lewis gave that advice in 1937, in an article titled, “Breaking in Print.” But it didn’t originate with him. He got it from his mentor Mary Heaton Vorse, who seems to be the source of the oft-repeated advice. As with most maxims, it’s short, simple, memorable, and frequently offered as sound advice to up-and-comers. But I’m here to tell you: It isn’t so. As reported in my previous post, I spent the past six months at my desk, working to finish a book that had been hanging fire for far too long. Taking inspiration from Neil Gaiman, who had put off writing The Graveyard Book for 20 years before realizing he’d reached a point of now-or-never, I decided I either needed to finish the darn thing or admit to myself that it wasn’t going to happen. At first, I sat. It seemed like the way to go. Although I often switch off between standing, sitting, and kneeling (in an ergonomic chair), I figured the conventional seated position would help conserve my energy, enable me to channel all my effort more effectively over the long haul. I was wrong. I soon found that rather than channeling energy into the writing, sitting diminished the intensity of the work. Worse, at the end of the day, I felt achy and spent—worn out from maintaining a posture counter to the one that humans are designed for. Before long, I was back to standing. The changes were dramatic. Aches abated. Focus improved. Page count increased. 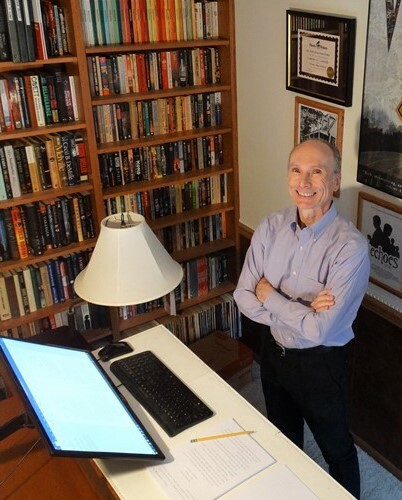 I didn’t feel spent at the end of the day–a big surprise since my plans to finish the book by the end of the year required spending six-to-eight hours at the desk each day. But best of all, standing improved the book’s pacing, enhanced its action scenes, made me feel like a participant in the adventure rather than a chair-sitting observer. These were not new revelations. I had been more-or-less aware of them before. But my brief return to sitting had confirmed them. And I’m not alone. 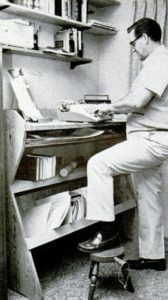 Other writers have recognized the benefits of standing. 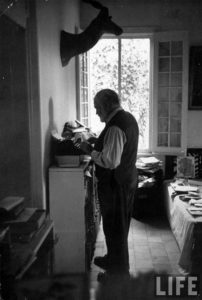 Among them, Ernest Hemingway is perhaps the best known stand-up writer, thanks in part to an iconic image published in Life Magazine (above right) and an interview in an early volume of the Paris Review. But there are many others— Charles Dickens, Winston Churchill, Vladimir Nabokov, Virginia Woolf, Philip Roth, Thomas Jefferson (left) to name a few. And the benefits of standing and writing have been documented for centuries, as noted in an 1883 article from Popular Science. 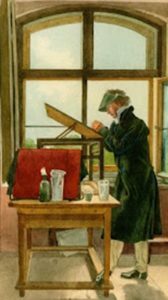 Written by physician Felix L. Oswald, the article “The Remedies of Nature” tells us that “literary occupations need not necessarily involve sedentary habits” and suggests “the alternative of a standing desk.” Clearly, my preference for standing is nothing new. But where does one get such a desk? Mine is improvised, cobbled together from found materials–an inverted drawer from a large bureau, the center pad from a dining-room table, a table-mounted armature for a flat-screen monitor. It works surprisingly well. But there’s no need to scavenge and improvise. With more people discovering the benefits of standing, retailers are now offering a variety of standing desk options, from modular add-ons that fit right on your existing desk to standing units designed to completely replace your existing work station. If you’re adventurous, you might even opt for a combination desk and treadmill, which some users claim reduces standing fatigue (which I haven’t found to be a problem). Moreover, if you’re a do-it-yourselfer, you might check out these instructions from the January 1967 issue of Popular Mechanics, which gives detailed instructions on how to assemble the setup pictured here (on right). Naturally, you will probably want to replace the typewriter with your laptop or keyboard-enabled tablet. Lots of options. Of course, you could just keep on sitting, but before you do, you might want to check out the video below, which presents a compelling argument for getting out of the chair and standing up for your writes. Take a look and let me know what you think. As always, you can chime in via the comment box below or at any one of the contact buttons above. Until next time, whether standing or sitting … scop on! “The 21st-Century Scop at Work.” Copyright © 2016 by The 21st Century Scop. “Hemingway Standing.” Life Magazine Archives. “Thomas Jefferson at Standing Desk.” The History of the Standing Desk. Suite NY. “Do-It-Yourself Standing Desk.” Popular Science, January 1967. “The Hidden Risks of Sitting. Ted.ed. “The History of the Standing Desk.” Suite NY. “Is Sitting The New Smoking?” David Sturt and Todd Nordstrom. Forbes.com. “Who Wrote at Standing Desks?” Open Culture.com. Powered by WordPress and delivered in 0.225 seconds using 39 queries.